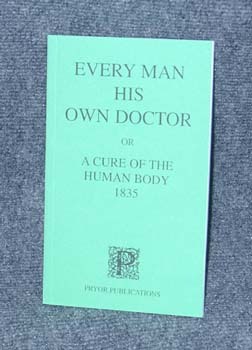 It is coincidental that both books on medicine are sequential in an alphabetic listing and were originally published within on year of each other, this one being published in 1835. This one makes use of many herbal ingredients but also uses chemicals that, if you visit an 18th or 19th century apothecary, you will find written on the containers on the apothecary's shelves. Then, not being content just to cure ills, there is a brief section with receipts for cleaning textiles or other items and a few other receipts for household purposes. Toward the end, you are also instructed with several cures for diseases in cows, horses, and sheep. Finally, there is a couple of pages with the therapeutic uses of electricity.